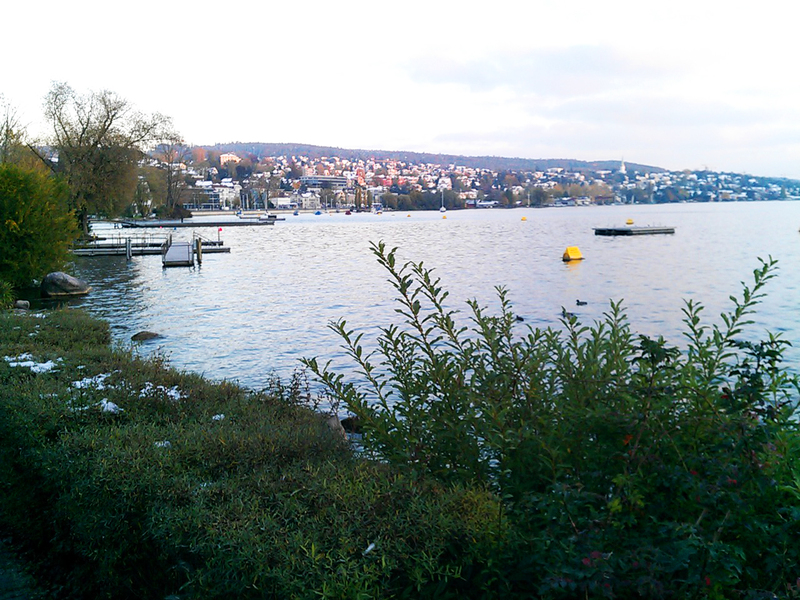 If you want to experience beautiful vistas, quiet parks and waterside life in Zurich, just head out to Lake Zurich for your next run. 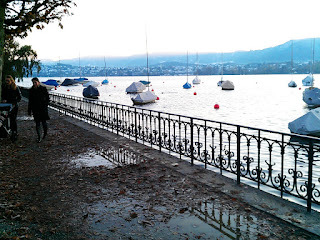 Zurich is located at the north end of the narrow lake, so you can either run down the east- or west-shore. This run covers the east shore, a trail that I first ran about 20 years ago. That was in the summertime. This trip, it was late October, with snow on the ground, so the memories of crowds of swimmers and sailors enjoying the evening were replaced by dark runs along a lonely shore, but still it's a great place to be. 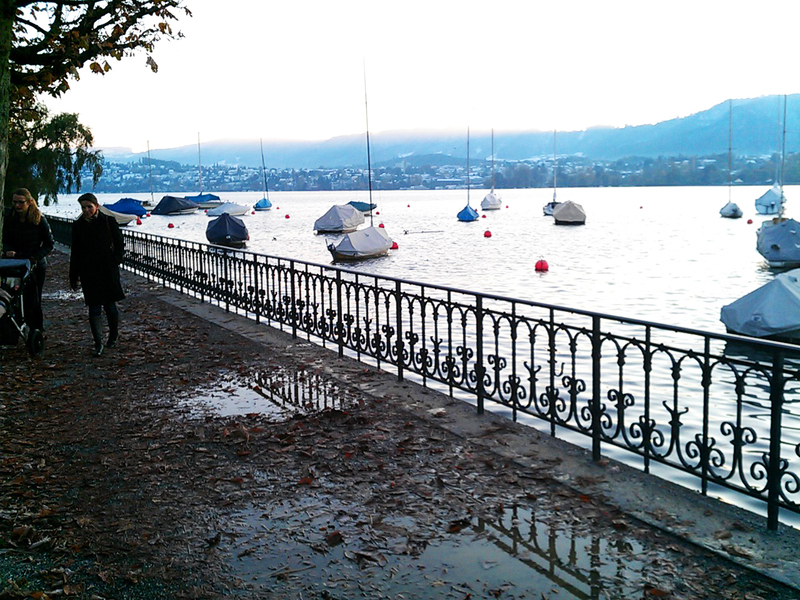 The shore out to Zurichhorn is a long, thin park with a promenade. It passes a series of small-boat marinas and swimming spots. Lined with exclusive hotels and villas, you can see the mountains rising up behind the western shore. 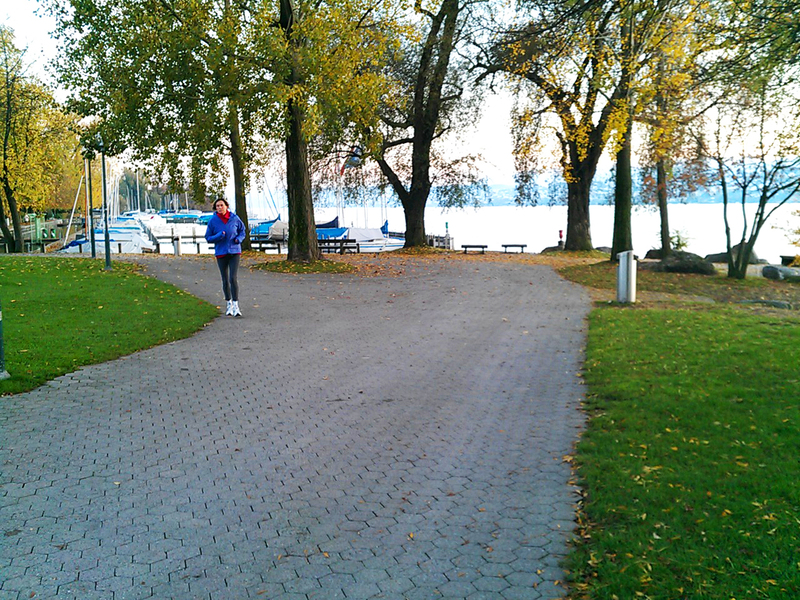 We'll start the run where the downtown meets the lake at Bürkliplatz. Standing there near the statue of Ganymede, looking out at the lake, our route will head out along the left side. 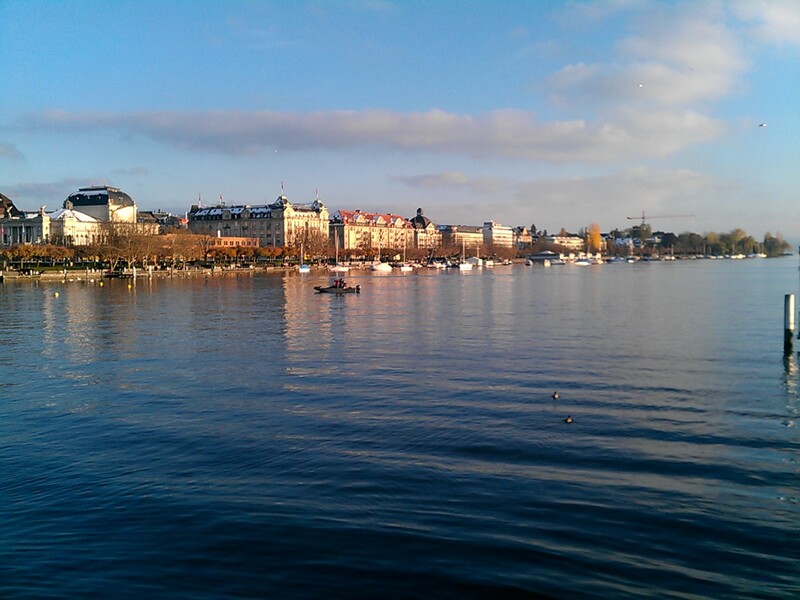 The lake drains out into the Limmat river to your left, later flowing into the Rhine. By the way, this is the same spot where the West-Shore Route begins. So turn to your left and cross the Quaibrücke bridge, and turn right to follow the shore southwards. 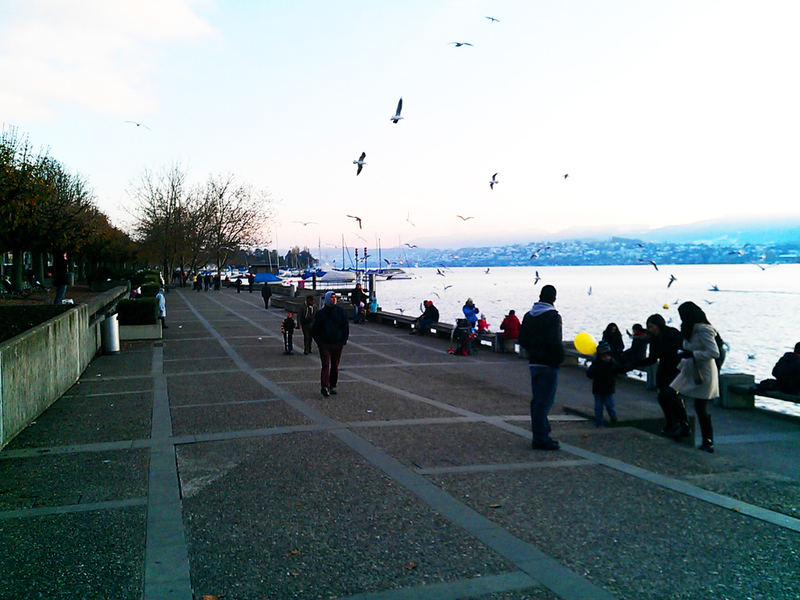 There are several parallel sidewalks in the narrow shore park. Choose the one that suits you best. 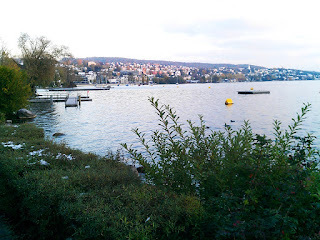 I like running close to the water and looking at the sailboats moored at buoys along the way. You'll go by the opera house on the left, then past the hotels. Later, it gets quieter, as the lakeside road turns away from the water. 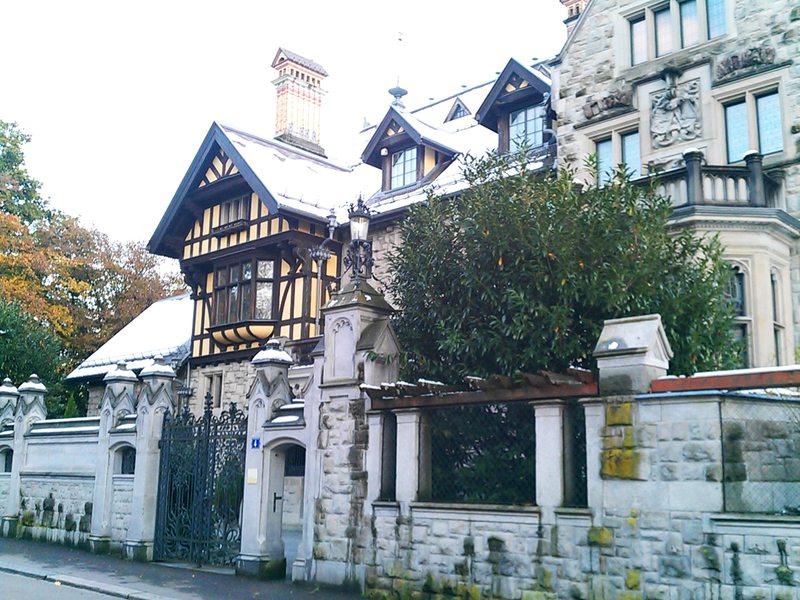 After 2 km, near the turnaround-point at Zürichhorn, the park gets wider, with a big lawn on left with a red, Chinese-style building. Just afterwards, the shore curves to the left. 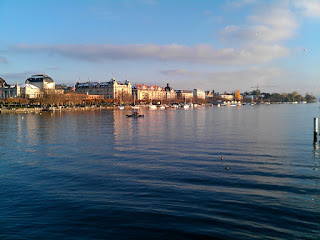 This is Zürichhorn. You'll cross a fast-moving stream. You'll then come to the Lake Side Casino with its waterside lounge. 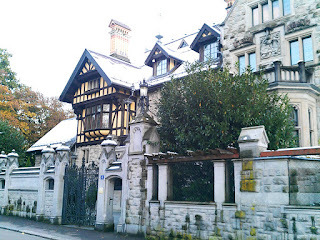 Turn around here: in just 100 meters a loud road joins the water at Tiefenbrunnen, and there is no direct waterside path for a long ways.